An admiring portrait of a rising star. In his debut biography, journalist and New Yorker arts editor Schulman traces Meryl Streep’s evolution as an actor from her childhood in suburban New Jersey to her breakthrough role in Kramer vs. Kramer (1979). The first talent anyone recognized in Streep was her beautiful voice, acknowledged when she sang in a school concert at the age of 12. “It was the first time,” writes the author, “she felt the intoxication of applause.” Her parents sent her for singing lessons, but after seeing Beverly Sills in an opera, she realized that she was not good enough for the Met. Instead, she performed in high school musicals and, at Vassar, stunned a professor with her talent for drama. He cast her in a spate of plays, even choosing some because they offered Streep good roles. In 1972, when she auditioned for the competitive Yale School of Drama, she won easy admission. Classmates included Sigourney Weaver, Christopher Durang, and Wendy Wasserstein, who called the place “The Yale School of Trauma.” The school’s “special brand of crazy,” writes Schulman, was created by its director, Robert Brustein. Despite the demoralizing atmosphere, Streep thrived. “Slowly but surely,” writes the author, “the students began to realize that Meryl Streep could outdo them in almost everything.” Drawing on theater memoirs, conversations with Streep’s colleagues and friends, and heaps of interviews that Streep has given over the years, Schulman has fashioned a lively narrative of the actor’s theater and movie work after she left Yale. The influential Joe Papp discovered her and cast her in productions in Shakespeare in the Park, Lincoln Center, and his own Public Theater. As her reputation grew, she was lured to movies, including The Deer Hunter, Kramer vs. Kramer (for which she won an Oscar), and Woody Allen’s Manhattan. 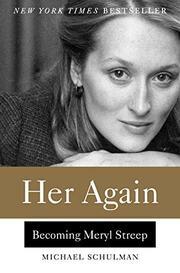 Schulman’s sensitive handling of Streep’s personal life rounds out the portrait of a superbly talented woman. A brisk, gossipy, and entertaining biography. When Meryl Streep accepts a role, she acts the hell out of it—period.